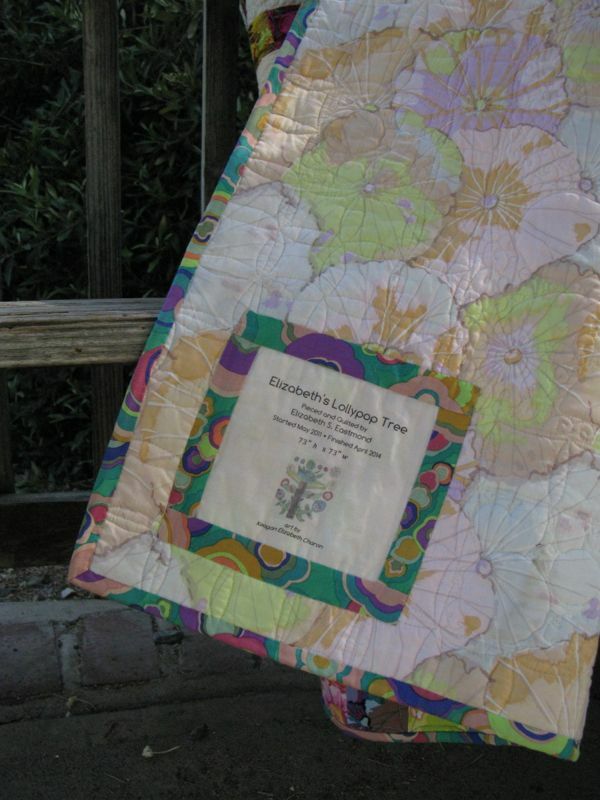 Elizabeth’s Lollypop Trees-Final Photos | OccasionalPiece--Quilt! 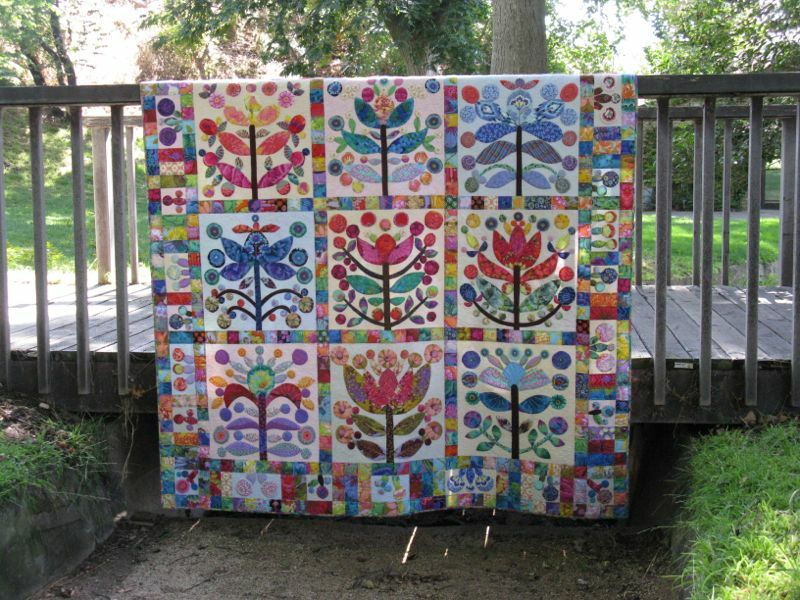 Posted on June 5, 2014 by Elizabeth E.
I wanted to take some final photos of my Lollypop Trees quilt, partly because I didn’t feel like I’d done an adequate job posting about it when I had finished it (and did worry about overkill in writing about it). But in writing this post, and taking some final photographs, I also wanted to think about it again, to interact with it. This quilt had been a part of my life for three years, and I worked on it fairly constantly, with a all-out blitz of quilting at the end. Quite frankly, it may be one of the best creative works I ever make, and I didn’t want to rush by it in a hurry. 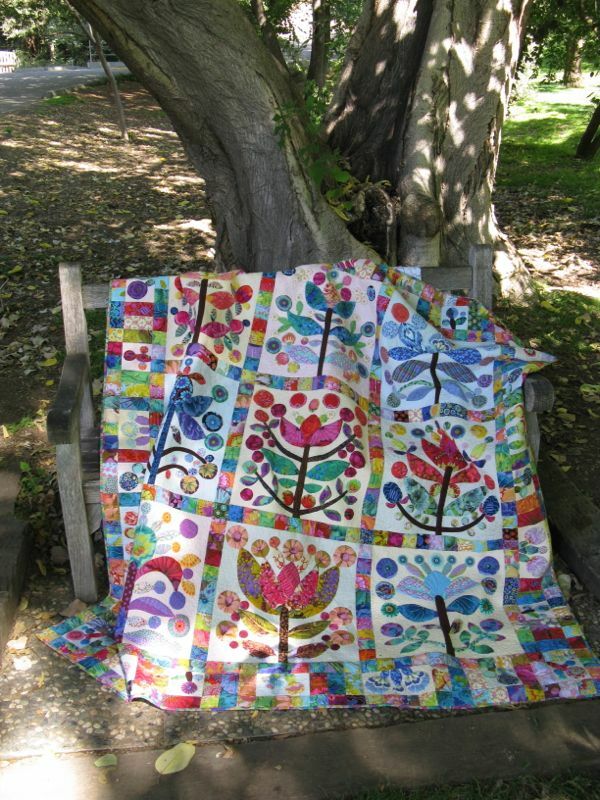 So I pulled it out again, and photographed each block (see tab above for close-ups) and spent one pleasant afternoon hour in our local university’s Botanic Gardens, pinning it up, draping it over benches, finding that place that would make me satisfied, and would do the quilt justice. The gardener at the Botanic Gardens even stopped and sat on a nearby bench, watching me drape the quilt, I’m sure partly to see my reaction if I would drop it into the stream below. I didn’t, keeping a good grip on it while I binder-clipped it into place. I used to walk over this bridge when I went to school here, first getting my undergraduate degree, and less often, when I was working on my graduate degree. I felt like I was revisiting a crossroads sort of place where I had existed as a younger woman, all full of spit and polish and fire and vigor. Today, with the heat nudging up to 90, I felt more spent, less sure of myself even though I am several years past that point when I used to bring my lunch and sit on one of the benches. Often my husband, himself new to this university, would walk up from his office and join me. We’d sit on one of these benches, always planning to buy one for the university if ever either of us should pass on, with the inscription: “Elizabeth and Dave loved this garden,” — an idea which seemed light years into the future. Less so, now. I walked up the hill past the lath house shielding plants from our hot Southern California sun, past the rose garden, up through the arbor. Just past the iris patch I found this gazebo. Like a bride in her glory, I arrayed the quilt, primping and draping and spreading out the bouquet of appliquéd flowers. Sunlight illuminated the quilt from the back, a bee settled in to buzz around my head, and a slight breeze blew the quilt to and fro. . . time to go. There is an old saying that goes something like this: “When the house is finished, the man dies.” I don’t think that applies to me, finishing this quilt, but there is something of a finality when a quilt that has extracted lots of creative energy is finished. It’s an ending, with the quilt becoming its own memorial, its own momento mori of that three years of my life, gone and never to be seen again. I fold up the quilt, dodge that bee one more time, and head down the through the shaded gardens. Elizabeth, you write with such passion and spirit! 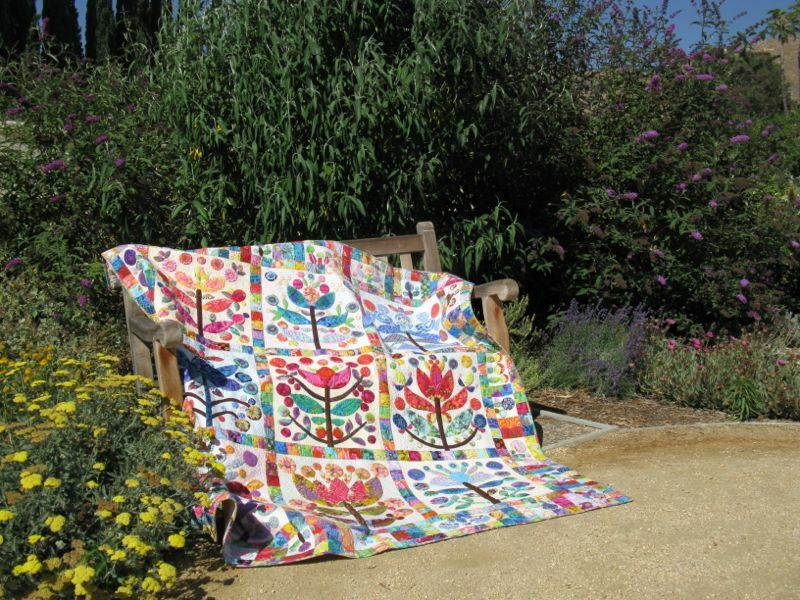 Your quilt is a beautiful memory of that time and it will be treasured for many, many years! It looks so wonderful in its various botanical settings! Love everything about this post Elizabeth. You have a way with words and a way with fabric too! You have something tangible and beautiful from those three years. They could have slipped away and left nothing but fading memories. What a lovely intersection of two parts of your life. It’s been fun to watch this quilt materialize (no pun intended). It’s been one of my favorites since the first block was done, and it’s just gotten better with each block, somewhat like a friendship that grows over time–like ours. This quilt is gorgeous. Makes me smile. LOVE IT! This is most definitely a masterpiece in my opinion. If I had a bucket list this quilt would be on it for sure. Love the photos and the story. Makes it all the more special. Now will you make me one? Your quilt is truly lovely. I have thought about making this quilt a few times. Thanks for sharing and the inspiration. 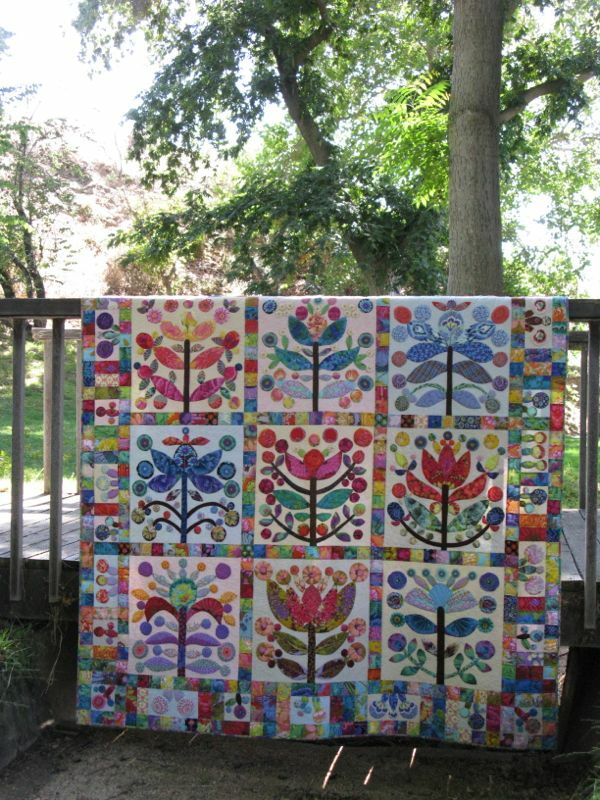 Congratulations on a beautiful finish of your Lollypop Tree quilt and photoshoot! I’m currently handquilting mine and like you say, making this quilt is also a remembrance of so much happening in my life! This is such a beautiful quilt and post. I read it twice…thank you! Okay, I think my resistance level has just reached zero! Beautiful. Don’t know what else to say, except in my opinion this post was not overkill in writing about this wonderful quilt. No one could have said that better – you are just the best wordsmith, and a pretty sharp quilter to boot! My campus (U of R) has a lake and gazebo like your campus and it, too, holds sweet memories for me. 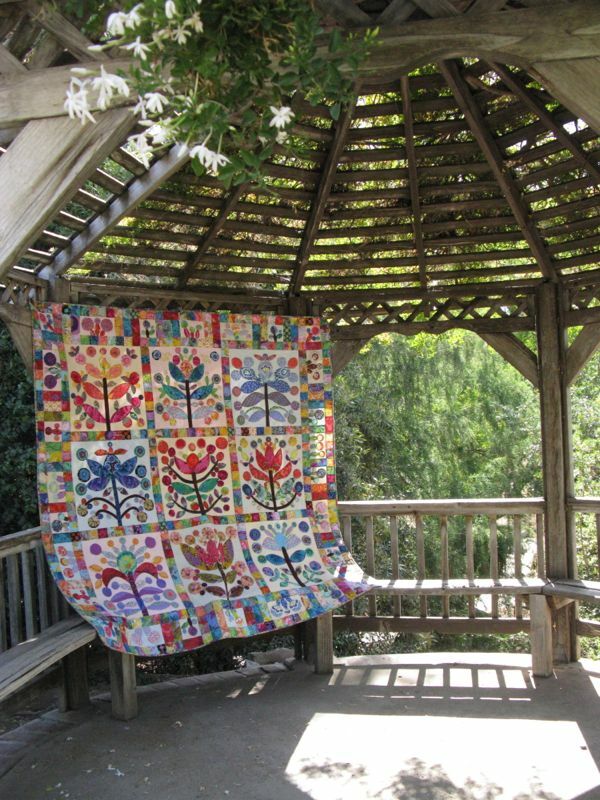 Wonder if I’ll ever make a quilt worthy of the setting for a photo shoot?! You ARE the inspiration, no doubt. Now, how are you going to enjoy the memorial? The quilt is astounding and you did it great justice. I love the trip down memory lane not only of your journey with its creation but also the garden. That adds to the beauty of the quilt. It is amazing and I’m sure you may feel as if you have given birth to it with a very long gestational period. Thank you for sharing your labor of love with us who will never attempt something of that magnitude. You are an inspiration as to what can be accomplished with determination and being steady in your endeavors. Gazebo pics 1 and 3 are my favourite 🙂 This quilt is just amazing, are you going to hang it in your home so you can keep looking at it? It is a beautiful quilt. What a stunning achievement – and a treasure. What a treat to see the quilt in all its glory. It’s a beautiful quilt and you’ve done a wonderful job and I know you are proud of yourself for finally finishing it. Thank you for sharing it one more time. I am so glad that you have shown it to us again, Elizabeth. It is such an incredible piece of work and well worth the three years. I hope you are going to have a place of honor for it in your home. I think you need to repost this each spring for all of us to enjoy again. The gardens were a perfect setting for the photo shoot too. I agree with every previous comment. This is a loving, thoughtful and respectful way to present your finished masterpiece. Thanks for sharing it with the rest of us. It’s wonderful to see a quilt that has been so lovingly made over time. It’s a beautiful piece of work and I enjoyed reading it’s story. 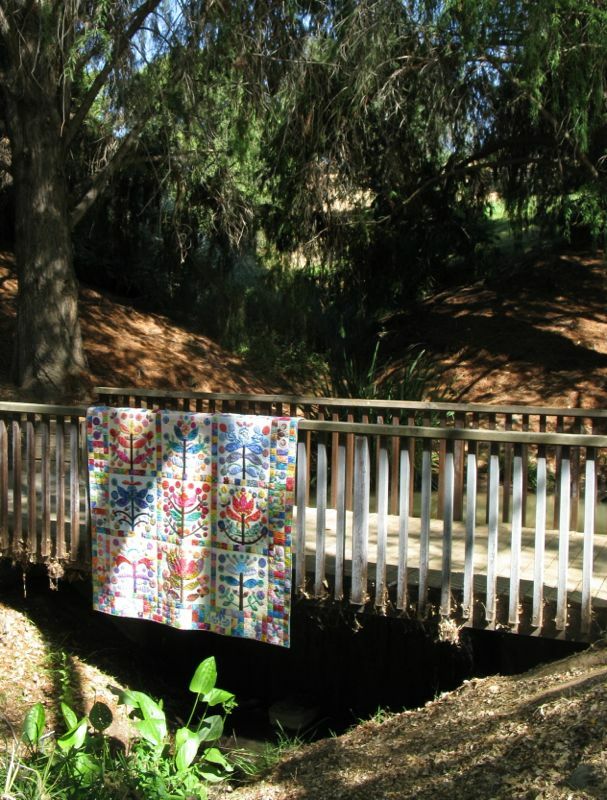 What a lovely place to walk, sit and take photos of your quilt! 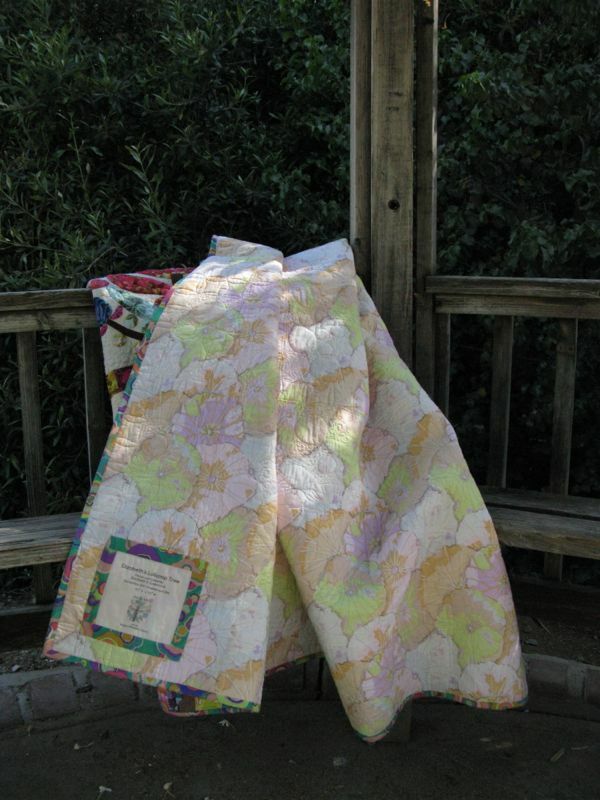 The quilt is fantastic, but not the end of anything really, just another step in your quilting journey. Lovely post. Lovely quilt. Lovely person. Beautiful. 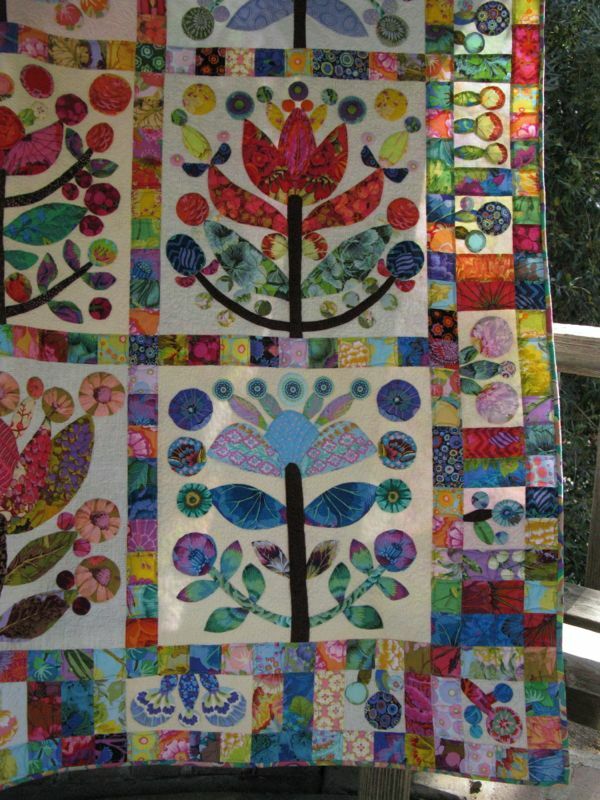 And yes, your Lollypop Trees quilt is rather wonderful, too. Every time I read one of these posts,it’s like reading a short story. Thank you, Elizabeth. And thanks for all the photos. I know you showed it at guild, but only got to see if for a minute while show and tell was on and then too busy at break to walk over and admire it more. This is so close and personal. Amazing quilt. Beautiful post about who you have become. So glad I’m your sister. Beautiful!! I love your quilt to bits – everything about it is perfect!! I have pinned your quilt to my Pinterest Quilting Bucket List… it is the only one on there, so one day I hop to take the plunge and make myself one!! Thanks for inspiring me!! 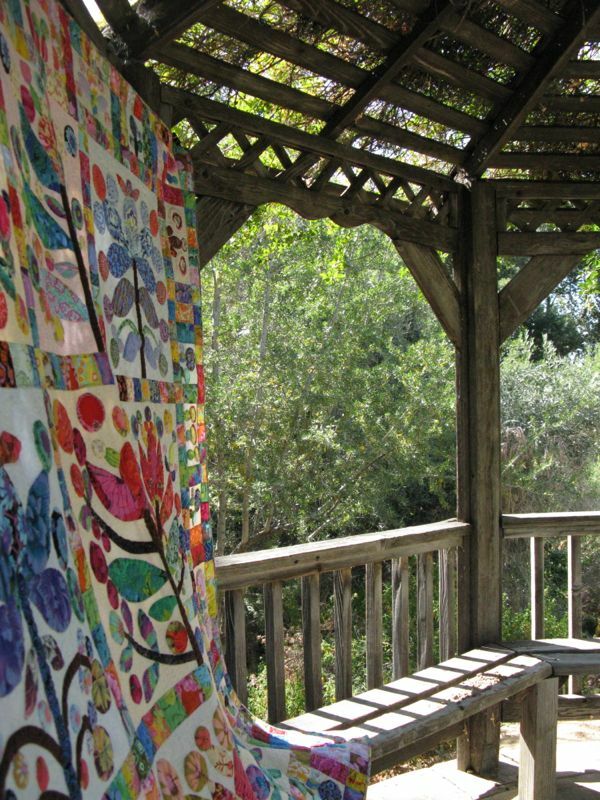 It’s a beautiful quilt, and you photographed it in a beautiful and special place. What a lovely story, from beginning to end. I know Elizabeth’s Lollipop Trees will have significance into perpetuity, and I hope your children and grandchildren will appreciate that. It’s nice of you to share this loveliness. beautiful version of this lovely quilt. 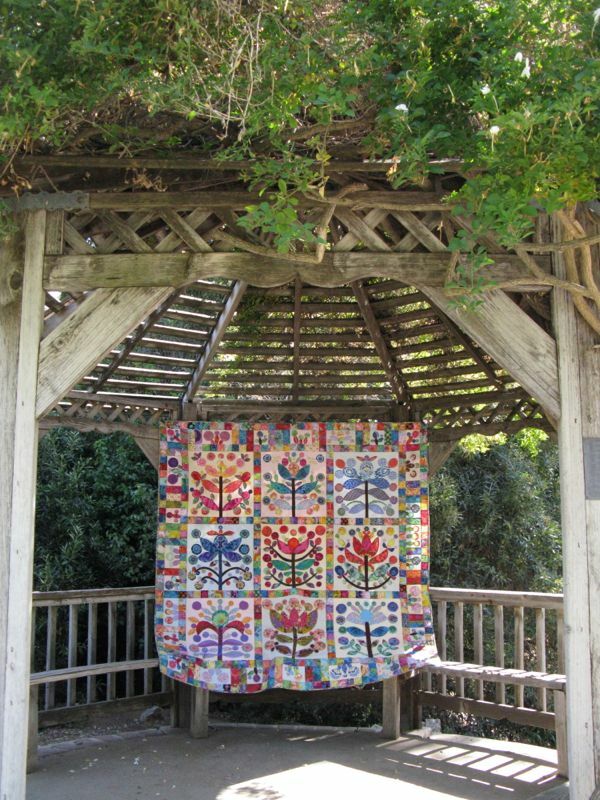 Have you seen the original antique quilt? The colors are so different. Your photo shoot is absolutely beautiful! What a beautiful post about a beautiful quilt, Elizabeth! Oh Elizabeth, this is the best post EVER! I love this quilt, and the pictures make it perfect. It turned out so beautifully! I love the entire photo shoot, too. Hello Elizabeth – This post was a joy. I’ve read it a few times, savoring the photographs. I’m glad you decided to recount the history, show close-ups, and give us a sense of your connection to the place. A quilt like this is for the generations, as is the beauty of creation. It was fitting how you brought the two together. Well done. 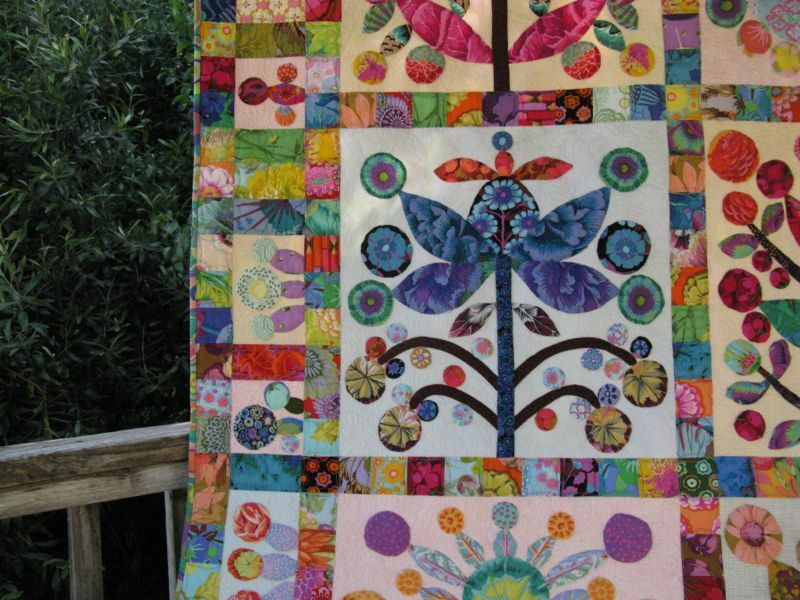 Your quilt is beautiful with its riot of color and shape. Great photos with the contrast of color and the old wood of the gazebo. As I read your post, I could almost smell the hot So Cal air. Pingback: Resolutions vs. Being the Best Self I Can Be | OccasionalPiece--Quilt! 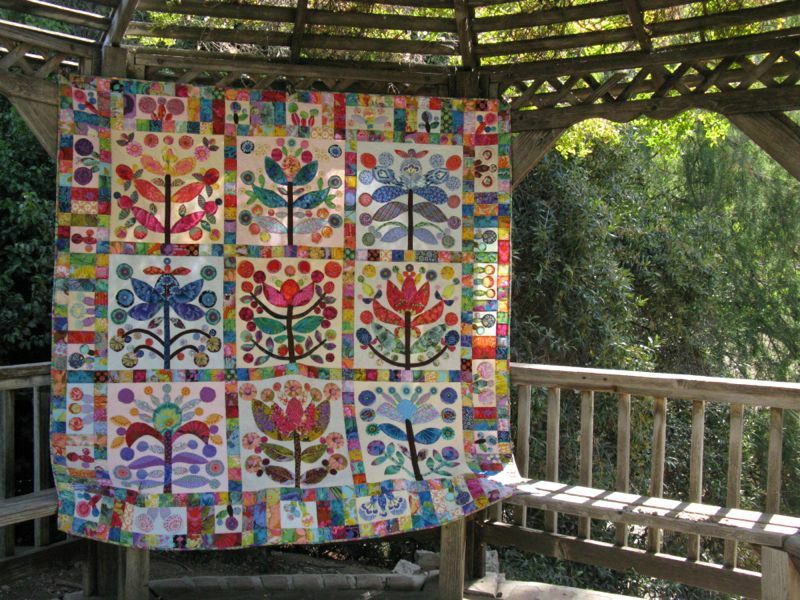 Pingback: A Lovely Time at Road to California 2015 | OccasionalPiece--Quilt!